This is the all-new Kia Cee'd, which will be released in the UK in June. Designed and developed in Germany but built in Slovakia with the European market in mind, the 2012 Cee'd doesn't just want to be on the road - it wants to own it. It's slicker and more visually-pleasing than the original Cee'd, which launched in 2007. The design re-think has helped catapult the brand into the 21st century and Kia's focus on technology seems to have strengthened. We went hands-on. Available in four trim grades – 1, 2, 3 and 4 – you can customise your Kia to your individual needs. Saying that, there are more or less two models you can opt for: just above basic or kitted out to within an inch of its life. Although all come with standard kit - electrically adjustable heated door mirrors, air conditioning, steering wheel-mounted controls, an iPod-compatible audio system with radio and CD player, USB port and Bluetooth connectivity – the grade 4 Kia is your best option if you're partial to tech-heavy motors (bearing in mind, this will push up the cost of the car quite a bit). T3 tested out the grade 2 Cee'd, with USB and Bluetooth connectivity and built-in USB port. There's no built-in sat nav on board - only a modest LED-lit screen which displays the essentials. It's certainly not the most high-tech car we've tested but for a little over £14k, it's the best you're going to get. On the entertainment front, you can bash out some beats courtesy of an integrated CD player but with USB connectivity also on-board, you can revert to your iPod playlist for lyrical mash-up madness. Setup is quick and easy. Simply connect your device using an iPod cable and you're more or less ready to go. Fortunately, the simplistic setup is carried through to the pairing of the system to your smartphone via Bluetooth. You can safely make and recieve calls thanks to a simple set of controls on the steering wheel, which also allow you to manipulate the on-board entertainment system, so flicking through radio stations is a piece of cake. Sadly, other than that, there's not much to get excited about. However, next month, we'll be getting our hands on the top of the line trim grade 4 Kia Cee'd, which comes packing a raft of gorgeous kit including a 7-inch touchscreen sat nav, built-in colour reversing camera system and an engine stop/start button similar to that in the Mini Cooper Roadster. We will ensure to update this post with our verdict as soon as we've taken it for a spin. With prices ranging from £14,395 for the basic entry-level 1.4 petrol Cee'd to £23,795 for the high-end 1.6 GDI petrol with six-speed dual-clutch auto transmission, the driving experiencing depends totally on how much cash you're willing to part ways with (as is the case with most cars). 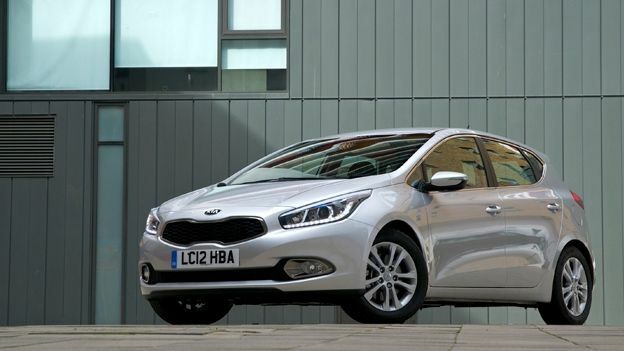 If you're uncertain about forking out almost a whopping £24k on a Kia motor, you're not going to get as strong a drive with the entry-level models, but then again, there are cheaper or more high-end alternatives you can opt for - and they could end up costing you considerably less. Despite looking quite compact, the Cee'd is shockingly spacious inside and the boot packs more junk in the trunk than J-Lo. The 1.6 GDI petrol – the model that T3 tested out - is smooth and steering is accurate: you won't find much fault with the performance of this car. Fair enough, it's not the fastest or the most comfortable motor to drive, but it knows how to handle the road and glides beautifully. The Korean car maker may be punching above its weight with the Cee'd – especially at the price it's charging for the high-end model (the ridiculously high-tech Audi A3 2.0 TDI S-Line costs over a grand less, and that's for the top-of-the-line version) – but overall, it's a comfortable transporter and the attention to detail, in terms of design, is spot on – it's clear that Kia put a great deal of thought and effort into the architecture of its latest four-wheeler. Tech-wise, you'd need to fork out for the higher-end trim grade 4 Cee'd if you want access to a raft of technical delights but if you're on a budget, don't expect anything special.